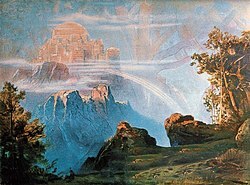 "Walhalla" (1896) bi Max Brückner. In Norse meethology, Valhalla (frae Auld Norse Valhöll "haw o the slain") is a majestic, enormous haw locatit in Asgard, ruled ower bi the god Odin. Chosen bi Odin, hauf o those who die in combat travel tae Valhalla upon daith, led bi valkyries, while the ither hauf gang tae the goddess Freyja's field Fólkvangr. In Valhalla, the dead jyn the masses o those who hae died in combat kent as Einherjar, as well as various legendary Germanic heroes an keengs, as thay prepare tae aid Odin during the events o Ragnarök. Afore the haw stands the gowden tree Glasir, an the haw's ceilin is thatched wi golden shields. Various creaturs live aroond Valhalla, such as the stag Eikþyrnir an the goat Heiðrún, baith describit as standin atap Valhalla an consumin the foliage o the tree Læraðr. This page wis last eeditit on 1 Juin 2015, at 15:27.